American rap artiste, Ermias Asghedom popularly known as Nipsey Hussle was on Sunday shot dead outside The Marathon Clothing store in Hyde Park, South Los Angeles. 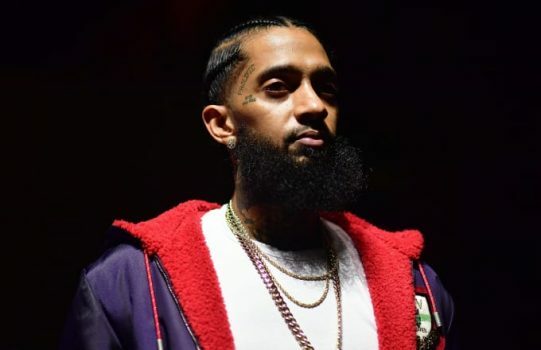 According to the police, the 33-year-old Grammy-nominated Hussle died shortly from the gun shot wounds while two other persons were injured in the attack and are currently receiving treatment at an undisclosed hospital. Lt. Chris Ramirez of the Los Angeles Police Department told reporters at a news conference that they had responded to a shooting call at The Marathon Clothing store. He said on arrival, they found three people suffering from gunshot wounds. He added that the authorities have launched a homicide investigation and are searching for a suspect who has been described as a black male in his early twenties. Law enforcement sources also disclosed that the suspect approached Hussle and the others by foot and fired multiple shots before leaving in what appeared to be a nearby waiting vehicle with a female driver. Hussle, who was nominated for Best Rap Album at the 2019 Grammys for his debut album, “Victory Lap” made a name for himself as an entrepreneur and was involved in community projects in South Los Angeles. Although Hussle is said to have had a connection to the Crips, it did not stop him from working with artistes who had rival gangs as he made music with both YG and The Game, both of whom have been tied to Bloods. He has also worked with other huge names in the music industry like Drake, Childish Gambino, 50 Cent, Kendrick Lamar, Rick Ross, Young Thug, Snoop Dogg, Ne-Yo, Kirko Bangz, Dom Kennedy, Tyga, Jadakiss, Chamillionaire and many others. Despite being a polished rapper, Hussle was no stranger to the streets. In 2018, he got involved in a brawl in West Hollywood, a fight which eventually turned out to be a case of mistaken identity. In September that same year, gun fire erupted in that same store but no one was shot as the rapper was not at the scene at that time. He is survived by his two children and girlfriend, Lauren London with whom he had a child in 2016.